Heliotrope (Heliotropium arborescens) is a tropical perennial plant grown for its dusky foliage and wonderfully fragrant deep purple flowers. It's also called cherry pie plant because the vanilla-like fragrance of the blossoms resembles that of freshly baked cherry pie. 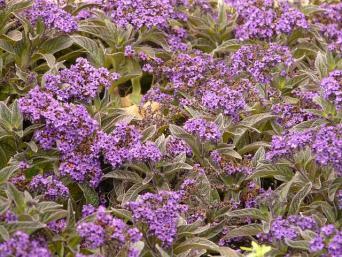 Under ideal conditions, heliotrope grows up to three feet tall and wide and flowers almost continuously. The flat-topped flowers are three to four inches in diameter and are commonly seen in shades of purple, though blue, pink and white varieties are available. The oval-shaped leaves grow up to three inches in length and are as ornamental as the flowers. They are deeply-veined with a dark green color and purplish glow that matches the flower color. This species is often grown as an annual bedding plant as it cannot survive temperatures below freezing; it is hardy to USDA zone 9b. Heliotrope is native to mountainous tropical regions in Peru, where daytime temperatures are relatively cool and nighttime temperatures never dip below freezing. So though it is not frost hardy, it also doesn't like extreme heat, making it unsuitable for the southernmost states. It tolerates full sun in the coolest climates, but prefers partial shade during summer in most regions. Heliotrope requires regular irrigation and rich, spongy soil with excellent drainage. Most gardeners use heliotrope as a bedding plant, although they are suitable for other applications. 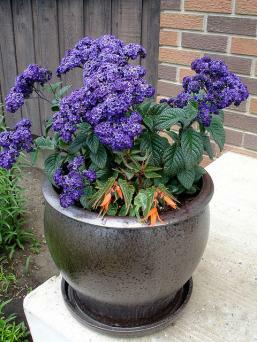 In frost-free climates, heliotrope is grown as a small evergreen shrub, either in pots or in the ground. It is a great plant for container gardens, which gives cold climate growers the option to bring it indoors for winter. The dwarf varieties are suitable for hanging baskets. In frost-free climates, it is a wonderful perennial for a flower border to mix in with other tropical species. Plant heliotrope in spring after all danger of frost has passed. It is easiest to grow in a pot as soilless potting mixes provide the perfect spongy soil conditions that it requires. If grown in the ground, enriching the soil with compost and planting it in a raised bed are two keys to success. 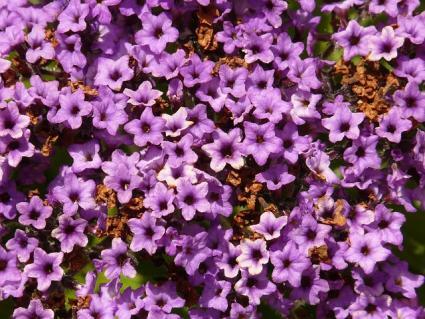 Heliotrope is commonly found in nurseries with the bedding plants in spring. Do not let the soil dry out - heliotrope may need water every day in summer, especially if grown in a pot. Fertilize sparingly with an all-purpose fertilizer and cut of the dead flowers as they fade to brown. In climates where heliotrope is marginally winter hardy, a deep layer of mulch over the root zone can make the difference between it surviving the winter and not. Heliotrope has very exacting growing requirements, but if these are provided it is quite resistant to pests and disease. Fungal pathogens that cause the leaves to shrivel and turn brown are an issue in hot, moist conditions; these can be treated with a fungicide if desired. Spider mites are often an issue when heliotrope is grown indoors though these are easily treated with an insecticidal soap spray by spraying them off with water in the sink. All parts of the heliotrope plant are considered toxic if ingested for both people and animals. This is only true in cases where large quantities are consumed, however, so cases of poisoning are quite rare. There are a few forms of heliotrope commonly seen with varying flower colors and growth habits, all hardy in USDA zone 9b. 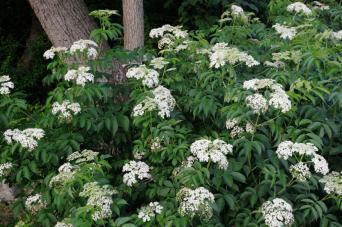 'Alba' is a white-flowering form that grows two to three feet tall. 'Fragrant Delight' grows up to 18 inches in height with deep purple blossoms that fade to light purple. 'Dwarf Marine' grows to just 10 inches and has intense blue flowers. The flowers of heliotrope emit a fragrance like the finest perfumes. Its rich color scheme also makes it wonderful species to design with whether in small potted arrangements or large flower beds.